I remember listening to this song in August and starting this post then, but I got carried away by Ramadhan then. This post has been lying in my drafts ever since. I really would not have been remembered this post or this video, but lately I have observed a lot of Nigerian dissing by other African countries especially the Eastern Africans. 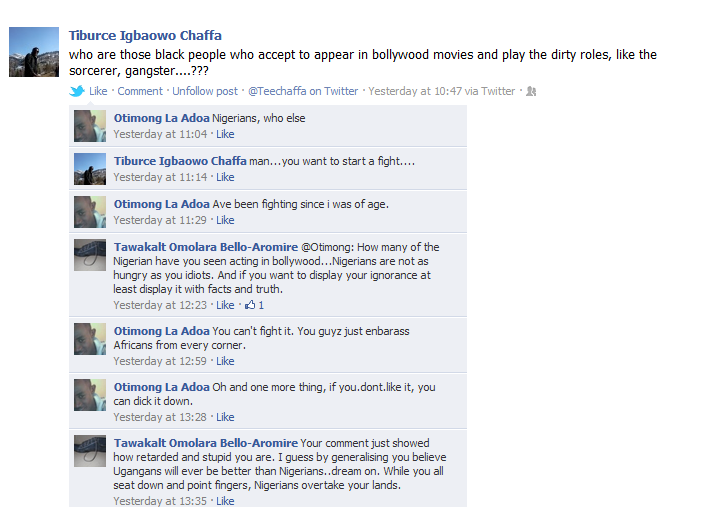 Yesterday I got into an FB fight with some dumbminded Ugandan. Generally, I stay off FB fights, I don't even bother to comment on some of the crap I see on that network. I don't even know what entered my head. This idiot is also an intern with TCS but he is in Mumbai. Once he posted a link of the Nigerian police arresting a goat on the program's Group, one of his country man cautioned him so no one even made an issue on the matter. He obviously does not know we are with the same company because I saw his tweets accusing the dude with the post for telling on him about his nationality. What he does not know is that his friend is my flatmate and even though I do not interact with most of them, I know all the African interns in TCS. My flatmate told me not to waste my energy on him as he particularly hates Africa and I guess he believes India is his gateway to a brilliant future. Like, they don't even hide their open hatred for Nigerians, they are the ones quick to assume and accuse Nigerians of every crime ever committed by a black man. These Nigerians, Those Nigerians, The Nigerians...all these you hear from Black, Non-Nigerians. I am just sick and tired of all their accusations. The other day, one of the interns from Benin Republic said all the crimes in his beloved country were all committed by Nigerians. I partially blame Nollywood for this nonsense. I mean these people watch the Nigerian movies more than we do. They expect us to be ritualist, scam them and thanks to movies like blackberry babes, some of them believe the girls are all the same. People have always asked me why I particularly stick to only Nigerians in this country, it is for reasons like this. Most of them ignorantly make statements which are so far from true. I have told them that while they sit, point fingers and hate on Nigerians, We continue to move on and grow. I am more at risk of xenophobia from a fellow African who is also black due to my nationality than racism due to the colour of my skin. This is highly ridiculous.....am not even offended. I find it amusing. it just shows how ignorant they are. So all the government corruption in Uganda are caused by Nigerians. Ha! A friend of mine even told me that in America, african americans look down on Africans. How ridiculous can people get. I really feel your frustration. We have misrepresented ourselves on different levels and the myopic ones have used it against us. See what happened in District 9, that was the highest level of dissing the whole country and our government couldn't even do anything about it. I agree with @ilola. 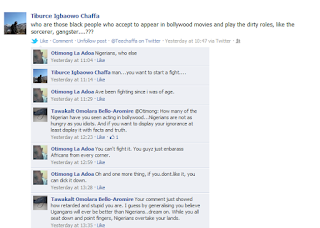 Until there is a change, we will still experience these kind of people who hate Nigerians. Bad news they say spreads like a wild fire and faster too than good news. Hold you head high, Laura, and move forward. I've learned that anger expressed at others results most often from an anger that can't be directed elsewhere. Throughout history people have looked down on each other, regardless of location. Yes, in the States some African-Americans look down on Africans; however, just as many Africans here look down on African-Americans. We're an immigrant country - the list is practically endless of who looks down on whom. We're very knowledgable here of where countries are. Having said that, if one comes here, the object is assimilation and we make every effort to stay above the fray. Their kids will smooth out the road. Actually, people here are very concerned about the disturbing news reports coming out of Nigeria and fear a lot of good people are caught up in a mess beyond their control. Our prayers go out to all. I can relate, though my awful experience came from a Caribbean course mate while on my masters degree. More than a decade ago but still fresh on my mind. Lara, I'm inviting your cool self to contribute your unique voice to part two of our Nigerian bloggers protest. This time, we're focusing on the wider campaign of "Occupy Nigeria", in solidarity with our brothers and sisters back home. It's pretty much a free format and no time limit. I'd like our titles to be the same: Occupy Nigeria: Nigerian Bloggers Protest Part Two. However, feel free to put your spin on it. Thank you for your support. It would be greatly appreciated. People will keep talking, and as long as we (well, some Nigerians) have the same perspective, how do you expect them to think otherwise? In our own little way, lets just make Nigeria better, and hope that the ripple will spread! Don't take it to heart, dearie.